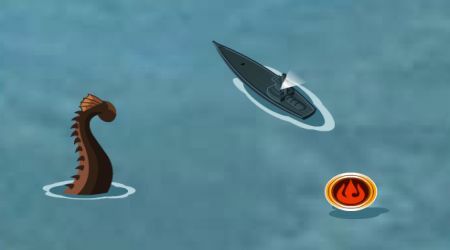 Use the left and right arrow keys to steer your boat. Use the up and down arrow keys to speed up or slow down. When you come across a village, move closer then press the enter key to attack it. 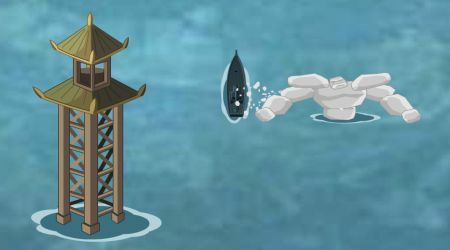 To make your boat stronger, rescue firebenders that are floating on the water then assign them to different tasks. Destroy walls by dealing enough damage to the towers that protect it. Your bending energy automatically fills up, this will give you the power to shoot fireballs. Press the A key to shoot from the left side of your barge. Press the S key to shoot from the right side of your barge. Hold down the fire key longer to build up the power of your shot. When your energy is full, press the space bar to unleash the circle of fire. You can also collect powers ups along the way, they will help you in your missions.